Martha Wells introduces the newest fearless heroine in teen literature: Emilie. Wells takes readers on an adventure that braves a new world and rivals the Journey to the Center of the Earth! Emilie is running away from her Uncle Yeric and Aunt Helena to Silk Harbor when she accidently boards the Sovereign, a ship designed to travel on aether currents. In the midst of the ship’s attack she finds that even the passengers are out of this world. Emilie meets Kenar, a creature called Cirathi, who was sent to lead Vale Marlende and her hired crew to find her father. Emilie has always favored reading adventure stories, but when the Sovereign’s rescue mission to the Hollow World gets underway she decides that she could actually get used to living the life of adventure. Emilie and the Hollow World is steep with action and adventure that’s not distracted by pointless drama. It’s one aspect of the novel that increased my opinion by the end. Another was Emilie’s character. As the story progressed Wells’ writing style seems to loosen and each character’s characterization became either more impressive or simply more defining. When the plan to rescue Dr. Marlende quickly falls apart and the crew on the Sovereign encounters danger after danger, Emilie steps up. She takes her role as rescuer with stride and puts her own fears aside to save the lives of others. By the end of the novel, Emilie is a walking, talking confidence machine. The pace of the novel is a little slow at first, but once you warm up to the subject and the characters it seems to move a bit faster. The science-fiction and magical elements of the novel are unique, but the explanations sometimes went over my head. Maybe it was the technical wording, but my eyes kind of glazed over on scenes that referenced how the aetheric engines ran. Even so, the plot was overall easy and fun to follow. 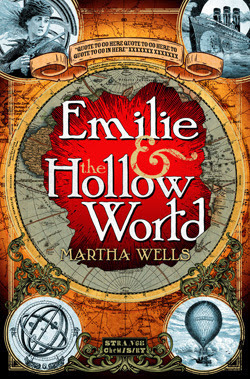 Emilie and the Hollow World is worlds different from most stories currently on YA shelves, but it’s the beginning to an exciting series that I wholeheartedly recommend!